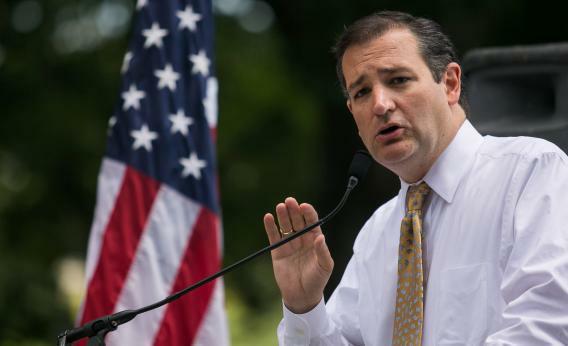 2016 election: Ted Cruz won't tell you if he'll run. Stop Asking Possible 2016 Candidates Whether They’ll Run or Not. It’s a Waste of Everybody’s Time. Any hint of presidential ambitions that a reporter can pull out of a politician (like Sen. Ted Cruz) becomes moot the moment he announces his decision. But there were lots of church friends there this weekend, and Jonathan Karl’s report for ABC News revealed just how much of an aura the “presidential buzz” gives you. Instead of getting questions about policy—you still get some!—you spend half your time coming up with boring answers about your actual presidential aspirations. KARL: What’s going on here? Are you running for president? CRUZ: John, [sic] we are having a national debate about which direction the country should go … and what I am doing now is trying to participate in that national debate. I understand that everyone likes to focus on the politics. KARL: Last year, that was your first election you’ve ever won. First time ever. Are you ready to run for president? CRUZ: You know, I’m not focused on the politics. KARL: Is it fair to say you’re not? CRUZ: John, I’ve been in the Senate all of seven months. The last office I was elected to was student council. So this has been a bit of a whirlwind. KARL: You were born in Canada. Are you even eligible to be president of the United States? It’s grimly fun to watch a politician squirm, but come on—do we think Cruz hasn’t pondered these questions? This sort of “grilling” of 2016-ers is largely useless. The right way of grilling them was paved by Charlie Savage, who in two consecutive presidential elections submitted questionnaires to each candidate, asking about their views of executive power. Did you know that Mitt Romney weighed in on indefinite detention? He did: “U.S. citizens would always have the right to challenge their detention in habeas corpus proceedings before a federal judge.” More importantly, Obama’s 2007 answers to Savage’s questions have become the basis for well-grounded charges of hypocrisy—or, sorry, “evolution”—in the president’s national security positions. But shouldn’t that be obvious? Ask a candidate five questions on the theme of “will you run for president,” and you’ve got answers that become trivia as soon as he makes the actual decision. Take him seriously and ask him to weigh in on some power of the presidency, and you’ve got a black-and-white statement that you can throw back at him for the rest of his career.